It’s time for more insights from April! Let’s look into consumers’ future financial plans, the effects of rising gas prices and the outlook for several retail categories compared to previous years. The flip side of the spending coin is saving. So let’s take a look at Financial Plans. Here’s another question we’ve been tracking each month for many years: Which of the following financial steps are you planning to take in the next 3 months? Nine times out of ten, paying down debt is prioritized above decreasing spending, but, as you can see from the chart, that’s not the case in April. As drivers increasingly pay to fill up their autos, it seems that they are looking to shore up other areas of spending to balance fuel expenses. Rising food and clothing prices also factor into the spending equation. So that $4 cup of coffee I was just talking about might get axed in the budget if prices rise to the $4 or $5 per gallon range this summer. 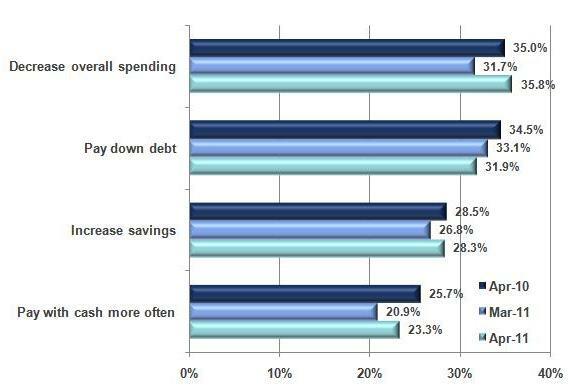 Paying down debt is still very much a priority, though fewer are planning to do so compared to a year ago. Increasing savings is just as important as it was back in April 2010, while a few more consumers seem less inclined to pay only with cash compared to that same time period. And, two in five are making changes to their regular grocery lists to cope with price increases. Some of the most targeted items for this budget “diet” include impulse items in general, snacks, candy, and cookies. I believe I’ve alluded to this several times now, so let’s finally take a look at the effects of escalating pump prices. 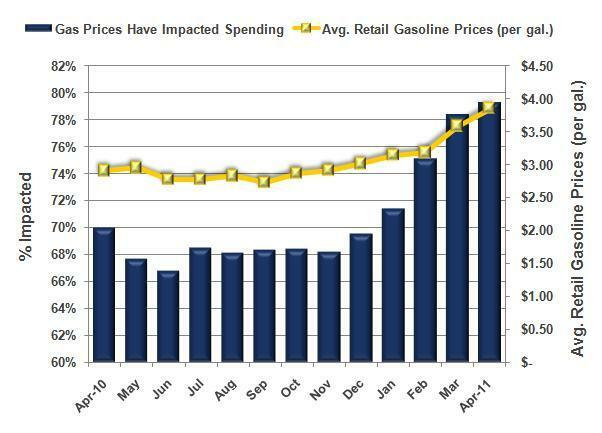 This chart is an interesting one, as we are viewing the percentage of consumers who say their spending has been impacted by fluctuating gas prices crossed by the average price per gallon of gas at the time our surveys were conducted, according to the Energy Information Administration. As you can see, the amount of people affected really took off once the price of gas hit $3.50. With pump prices rising again in April, we can see that the number affected rose as well. Now it’s time to move onto the BIG Forward Look, which maps out consumer spending plans over the next 90 days. The results are then tabulated into our Diffusion Index (Spend More – Spend Less) and compared to previous periods of time. In the chart displayed on the screen, we are comparing April 2011 results with March, April 2010, and April 09. As you can see, all merchandise categories are faring poorly compared to last month and last year. We are seeing improved results for most categories from April 2009, but one would expect improvement from a recession-addled period of time, wouldn’t they? And seasonal categories like Major Home Improvements and Lawn & Garden are areas of particular concern. 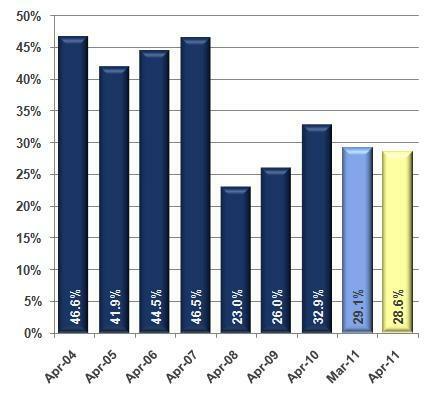 Finally, while I don’t have the pre-recession April 2007 results on this chart, all categories are in fact facing downward from this time period, so we’re still not nearing a spending recovery. That wraps up April! If you want more current consumer insights, including voting trends and media usage, be sure to check out http://www.BIGinsight.com. We update it constantly, so that data and insights are always fresh! This month, I will be reviewing the latest big insights on confidence, practicality, and personal finance, as well as some timely data on how rising gas prices are affecting consumer spending. The April Consumer Intentions & Actions survey was collected April 5th through the 12th and includes the thoughts of about 8500 consumers. I always kick off this discussion with Consumer Confidence, a key indicator of consumer’s overall mood and how willing they are to spend. Let’s take a look at this data over two different time periods. This first chart displays a 13 month snapshot of those who are very confident or confident. As you can see, we are now in the third consecutive month of decline, with 28.6% who are confident or very confident in the economy. This current reading is four points below April 2010 sentiment. Comparing data back to 2004, you can clearly see the toll that the economic downturn has taken on the consumer psyche. A year ago, it may have appeared that confidence was on an upswing, that maybe this was a turning point for recovery. But now, it seems that any improvement in confidence a year ago was more of a blip on the radar screen. As I’m sure that you can imagine, consumers who have little faith in our economy aren’t exactly big spenders when it comes to shopping. In light blue is I focus more on what I NEED rather than what I WANT. And then in green is I have become more budget conscious. 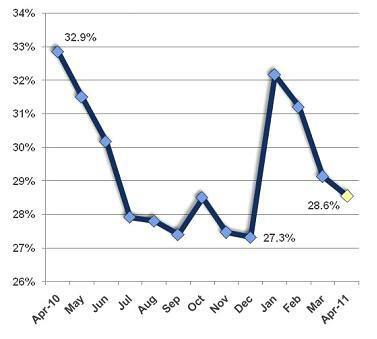 As you can see, each of these attributes saw a slight uptick from March, reflecting declining optimism in confidence. Interestingly, this month’s figures are slightly below those from April 2010, when confidence was four points higher than it is now. How can this be explained? Perhaps it’s that while consumers maintain a gritty view toward the economy, they are willing to “give in” – on occasion – when it comes to spending. Or a Saturday evening out. Whatever the guilty pleasure may be, don’t look for consumers to overindulge or revert to pre-recession spending anytime soon. 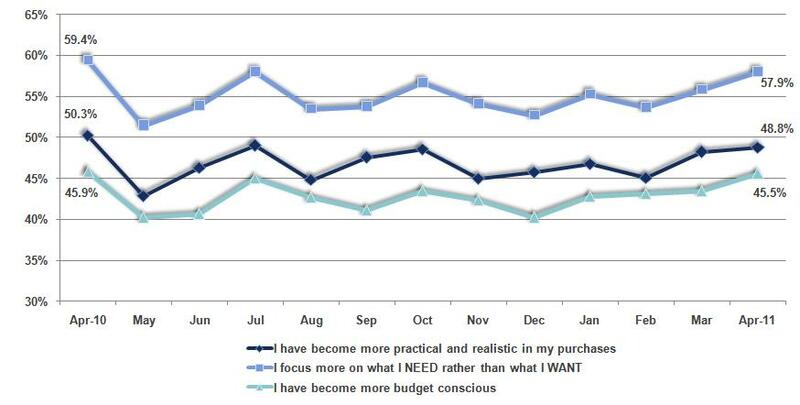 Nearly half of consumers still contend they are spending practically and more so are just focused on the necessities. Check back later this week when I will continue the Consumer Intentions & Actions discussion. Up next, financial planning, pump prices and a look forward into future purchase plans! In the most recent American Pulse™ survey, we asked respondents to answer questions about both citizenship and pop culture to see which they were more informed about. Contrary to what some of us thought would happen, there were no shocking results that put pop culture well above citizenship on the radar of these respondents. Surprising to me was that only 20.3% of Adults 18+ knew that “GTL” stood for “Gym, Tan, Laundry” which, of course, has been made famous by the always entertaining MTV hit Jersey Shore. The citizenship question that stumped people the most was, “Who is the current Speaker of the House of Representatives?” with only 53.0% knowing that it was John Boehner. I found the overall results to be encouraging. Registered Voters indexed higher for all correct citizenship answers compared to Adults 18+ as a whole. While the nature of my job requires me to be informed about all aspects of consumers and society as a whole, it’s good to know that others are staying informed about the role of their government and the people who run it. When we head to the polls and exercise rights that many in the world do not have, being as informed and up-to-date on what you are voting on is crucial, regardless of your political affiliation or lack thereof.